For single channel connection between e.g. a receiver and an active sub-woofer (often called LFE channel = Low Frequency Effects) with balanced input and XLR chassis contact. Supra Sublinks low capacitance and high noise interference immunity make longer cable routing possible, which most often is the case for sub-woofer connections. Further the low capacitance allow bass pulse build-up without flattening or slow down, the really desirable property of an excellent hifi sub-woofer sound. 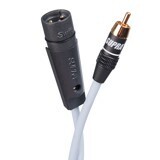 This cable may also be used to connect active speakers such as studio monitors with balanced input to a single-end source. The properties of the Supra SubLink is of a high standard also for full range purpose.